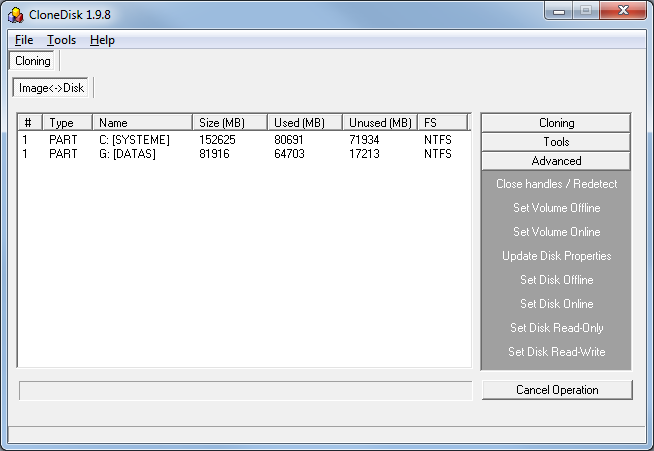 all this being potentially handy a in a winpe where the disk management interface would be missing. Latest version can also mount ISO files using open/attach VHD : tested in windows 8.0 and windows 8.1, thanks to MS virtual disk api's . Will not work in windows 7 and lower versions. I dont know how to use clonedisk, it seems to be very useful but really all I have been using it for is the file copy with copy ACL feature to move windows from images to partitions and visversa. I just tried the latest version for that but I dont find the file copy function, is it still available in new version? 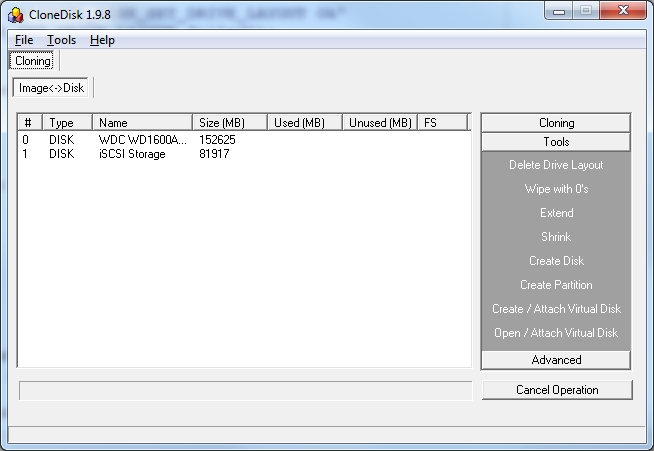 I have removed the file copy feature so that CloneDisk focuses exclusively on byte to byte copy. In your case, why not use the partitition to partition clone feature of CloneDisk (right click in main window, select 'display PART only') ? You then also need to handle the target MBR and BS. And you can then end up with a semi or not working copy. If you really want to stick to file to file, you can always try : xcopy /x /e /c /i /h /k /y /w c:\*. * d:\ . the main reason that I use file copy is because I dont know another way to move a windows installation from one place to another when the sizees are not the same. for instance, I have made images of different windows as small as possible for saving but I like to restore them on real partitions that are much larger when actually using that installation. also, it appears that clonedisk has options that can prepare a windows installation for booting from USB while offline, is this correct? FileCopy is used in Win_Restore.exe which can be used to Restore Windows XP/7/8 from Portable VHD file to HDD or USB partition. Correct : go to advanced , registry tools, enable usb. I would also then tick "rediscover mounted devices at next reboot". was the usual "Xcopy replacement". A console backup/archive tool for Windows NT/2000/XP/2003/Vista/2008/7. It uses the same backup methods as the ntbackup or robocopy programs and thus backs up all information and meta data on an NTFS volume. The main difference is that strarc is free and open source and produces stream archives you can store on tapes, disks or anywhere else or it can create the archive stream to stdout so that it can be compressed easily using stream compression tools like gzip or bzip2. The command line switches and parameters are quite similar to the *nix tar utility and it can easily be used to clone an entire NTFS volume including everything, files, directories, their time stamps, attributes and security information, compression attribute, alternate data streams, junctions, hard links etc. With this new 0.1.3 release it is even possible to backup the registry database files of a running Windows system. An information file called strarc.txt describing usage and including how-to:s and other documentation is included in this zip file. The documentation is also available here. I see that strarc has option -j to copy junctions but not the files on the joined filesystem. In Win_Restore.exe I make use of Robocopy (for Users and ProgramData dirs) and the rest is done with xcopy and /e /c /i /h /r /k /o /x /y to copy also ACL info of NTFS. In Robocopy I skip the junctions by using /XJ option, but I think now it might be interesting instead to use strarc and also copy the junctions. Actually, is it really needed to copy junctions or don't you need them in general ? AFAIK up to Windows XP and 2003 they are not "integral" part of a "default" install. Starting from Vista and later, they "are" (or at least "should" or "may", possibly depending on SP and what not ). Or maybe only hard links ad not junctions? No more details, I am afraid. In any case, if the idea is to "copy", the "copy"should be "identical" to the "original", IMHO, though of course a "good enough" copy may do. OK thanks. I try to avoid command line only solutions when possible with these types of operations because of the risk of mistyping an entry can be a disaster sometimes. hi Wonko, thanks for chiming in. very helpful info (as usual) reading now. I could really use a GUI copy or imaging tool for all types to and from that allows smaller images to be copied to larger ones while leaving the free space that is left usable. Im sure there is something that does this but I havnt found it or if I have I havnt found how to. Ever heard about batch files (or any other form of scripting)? Latest clonedisk version has the copy files feature back, just beneath the clone disk feature. I use this command line xcopy /e /c /i /h /k /y /q /r /o. The command will run under the system account to get a chance to grab more files. Ideally, you should run this under winpe, not on a live system although I had some success in the past doing it live. Link broken on your webpage : http://chitchat.at.i...vmware/vdk.html . plus any number of winbuilder projects that include original or modified versions. I have, and I have also mistyped entries in them so Im not sure how why that helps but I only know the basics about batch files. After copy then Win_Restore.exe will fix Windows for booting from Target Drive (HDD or USB). Could you force CloneDisk to by-pass the floppy drive controller on demand? yep i could implement that (or rather exclude a: b: in my getlogicaldrives loop). Can you try "display DISKS and PARTS" ? There it should "only" display PARTS below existing physical DISKS. The drive is not ready for use; its door may be open. Please check drive A: and make sure that a disk is inserted and the drive door is closed. Ok, I have uploaded a new version. I will now look for the 'floppy' string in the dosdevice name and if found will discard the drive. I used VFD to perform my tests. Give it a try and hopefully you should not have this issue anymore. Thanks for the upload. The problem is solved. If I hit Display Disks and Parts, CloneDisk will list only the first partition of the drives. Shouldn't the tool display all the partitions? I tested this feature on two different computers. The result is the same. Only one partition is showed. Display PART only works fine.